Marcus Sandifer, chosen by his peers as the "Most Outstanding" graduating JD student for the Class of 2017, attributes his success to his family, his professors and his desire to always do better for himself and others. Marcus Sandifer remembers bringing home a progress report bearing a grade of 97 and hearing his school-teacher mom say, “I’m concerned about where those other three points are. You did a good job, but you can do better.” He laughs when remembering these moments, noting that he set his parents up to expect greatness. Sandifer, a candidate for juris doctor, was valedictorian of his high school. He was the Student Government Association president and the class president. He maintained that trend through his undergraduate years at Florida Agricultural and Mechanical University (FAMU), where he earned a degree in business administration in 2004, and throughout his law school career. At Emory University School of Law, Sandifer served as vice chair of the American Bar Association Student Division and a fellow in the Office of Admission. He is a member of the Black Law Students Association (BLSA) and the director of community service for the national arm, through which he was awarded the BLSA Trailblazer Scholarship for Southern Region Member of Distinction. And he has been chosen as the "Most Outstanding" graduating JD student for the Class of 2017, an honor conferred by his fellow students. While his mother taught school, his father was a retired police commander. Every moment in Sandifer’s childhood focused on learning. On family vacations, his mother would require him to complete book reports. His father would have him sit up front and navigate during road trips. But it was his siblings’ sacrifice that would nurture in Sandifer the desire to help others. 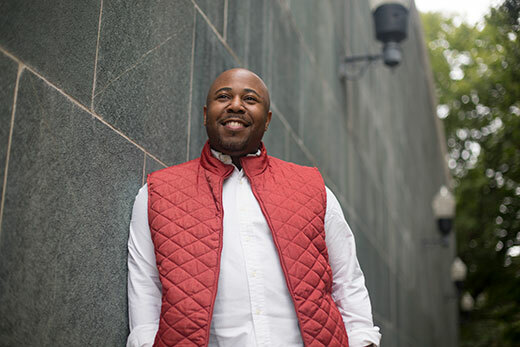 The youngest of seven (there is a 20-year difference between him and his oldest sibling), Sandifer was faced with tremendous expectations – and support. “My siblings invested a great deal in my success. Most of them didn’t have children when I came along, so I was their baby," he says. "They helped my parents send me to private academies and expensive summer camps. They provided opportunities and experiences for me that they’d not had." So, when he graduated from college, while he knew he wanted to go to law school, he decided to go to work first. He was inclined to provide for his nieces and nephews some of the same experiences their parents had provided him. While working, Sandifer applied to Emory Law and was not accepted. He also was not defeated. “Emory was always my top school. Always. I decided at 16 years old that I was going to Emory Law. I knew that if I came here, I would be successful,” he says. So, when the time was right, he applied again – and was accepted. Sandifer cites five professors in particular who helped make his years at Emory Law outstanding. “When we had Black Lives Matter demonstrations at the school, Dean [Robert] Schapiro was out there with the students, and that doesn’t happen at every law school. It sets a tone. I was very proud to be an Emory student that day,” he says. He calls Fred Smith Jr., visiting professor of law, "incredible." “He doesn’t hide from the truth and is not afraid to tackle difficult subjects," Sandifer says. John Witte Jr. — Robert W. Woodruff Professor of Law, McDonald Distinguished Professor and director of the Center for the Study of Law and Religion — inspired him with the way he integrates his faith with the law. Professor Timothy Holbrook — from whom he’s never taken a class — approached him on several occasions to tell him he was proud of his accomplishments, he says. And the admiration is mutual. After graduation, Sandifer will join Alston & Bird LLP in the Litigation & Trial Practice Group, focusing on commercial and securities litigation. He says he is humbled by the attention — and by the supposition that his experiences and performance have truly been "outstanding."